Members of AU's Working Group on the Influence of Slavery, including senior and Eagle opinion editor Nickolaus Mack, begin a presentation on the results of their research on Jan. 30, 2019. “Knowledge of our past is essential to understanding and identifying a course for our future, to find opportunities for AU to incorporate its history both positive and negative into commitment to anti-racism,” said Mark Schaefer, University chaplain and co-chair of the working group. The formation of the group was prompted by Nickolaus Mack, the managing editor of opinion for The Eagle, who published columns critical of the University’s annual Founder’s Day Ball last year. In February 2018, Mack wrote a column calling Founder’s Day a “largely dishonest celebration” because AU did not acknowledge that the University’s central founder, John Fletcher Hurst, was a slave owner. Weeks later, Fanta Aw, the vice president of campus life and inclusive excellence, announced that AU would form a group including staff, faculty, alumni and Mack to explore the University’s potential connections to slavery. In the group’s first report released last week, the group uncovered three key findings related to AU’s history as a Methodist university. The working group found that enslaved people were present on the land that is now the University, slaves worked for families involved in the University’s history and some of the funds that helped develop AU accumulated from wealth from the slavery era. The group has also published a full timeline of AU’s history and its relation to slavery. Their research also confirmed that Hurst was a slave owner, having inherited an individual named Tom King from his father. Hurst freed King in 1862, according to the records collected and analyzed by the University’s researchers. The group has developed a list of recommendations and ideas for next steps. One recommendation is to create a memorial on the grounds of the president’s house dedicated to enslaved individuals that worked AU’s land and Tom King. Some other suggestions include integrating this history into university curriculum and the AUx program, a recommendation that has already been implemented in the second-semester curriculum for first-year students, Dean of Undergraduate Education Jessica Waters said at the meeting. Most importantly, however, the group wants AU students to be part of the process of implementing these recommendations. Several members stated that it is completely open to new ideas and continuing the conversation with the AU community. “Hopefully we would have an exhibition or something within the museum for students that I know love to go to that museum, to see the history and see these findings and contemplate and reflect,” Mack said. Mack also wants to continue to work on the issue of displacement of the black community in D.C. While Mack will continue his involvement in the project after graduation, he wants to pass the torch to the rest of the student body. “I want to make sure that this is a community discussion and this doesn’t end with me or my graduation,” Mack said. Editor’s note: Nickolaus Mack is the managing editor of opinion for The Eagle. 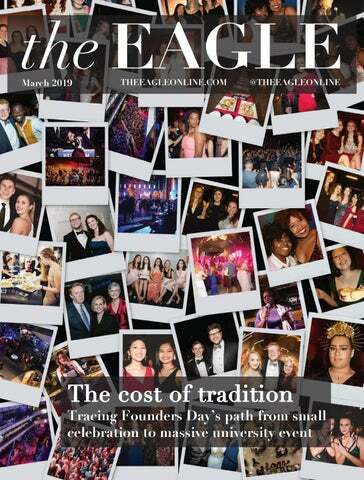 David Aldridge is a former editor-in-chief of The Eagle and a member of The Eagle’s alumni advisory board. Neither was involved in the writing, reporting or editing of this article.